Watch Jay Leno take a look at the new VIA Motors VTrux – and love them! 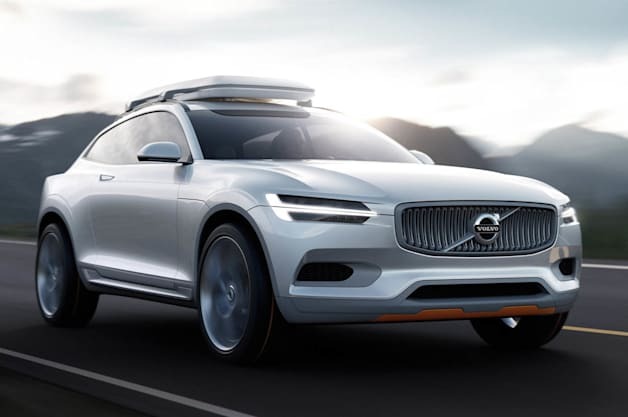 If you’ve been wanting a gas saving SUV or pickup truck this is the best of all possible worlds. It uses the same idea that makes the Chevrolet Volt save so much gas and even adds a power export option so you can run power tools or your house with the batteries and onboard, range-extender generator. Take a look and let us know what you think in the comments. Here’s a sneak peek at the ribbon cutting event that took place at downtown Melbourne’s newest EV charging station. 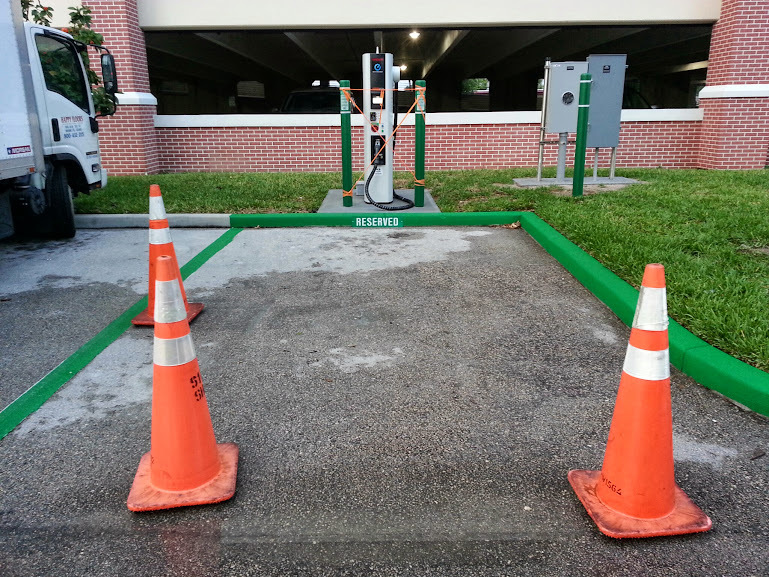 The first DC fast charger in Brevard County, FL. The Space Coast EV Drivers were invited to do Q & A with attendees at the ribbon cutting. Stay tuned for photos and videos from the event. Lots of electric vehicle drivers were on hand to celebrate the unveiling. Recharge your EV with a Volcano!? Here’s a neat article about a Nissan Leaf owner in Hawaii that used up most of his car’s battery climbing the long winding road up a dormant volcano mountain then had a full battery again when he got back down. Thanks to the regenerative braking that all electric cars, plug in hybrids, and regular hybrids have he was able to recharge the battery coming back down the mountain. This is something you can only do with electric cars! We’ll set up at 9:30 am as part of the car show that will be 10 am to 3 pm. 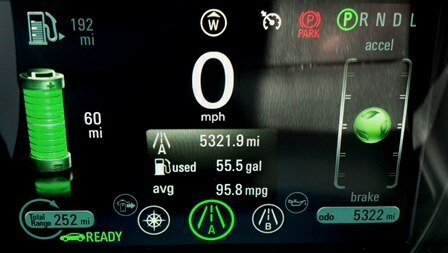 Chevy Volt Owners Love Their Cars! Take a look at what people are saying about owning the Chevy Volt in a The Sierra Club newsletter – including one of our very own members! We’ll be at the ribbon cutting for the new CHAdeMO charging station installed at the Melbourne City Hall in front of the parking garage. You should see our tent and table and banner set up for the public to ask any questions they may have about EVs and even take a test ride or two. We’ll have information and other print outs to give away to help decide which EV is right for you. The event will take place in the front parking lot. Attendees may park in the garage. The public is invited to attend the opening of the City of Melbourne’s newest electric car charging station. The new station is a Level 3, 480 Volt direct current fast charger. Several electric vehicles are capable of accepting the Level 3 CHAdeMO charge including: Nissan LEAF, Mitsubishi i-MiEV and Tesla (with adapter). The cost to charge will be $0.13 per kWh,* and the station will be accessible and open to the public 7 days a week/24 hours a day. The mayor will deliver opening remarks, and a Melbourne resident will be the first to “plug in” his electric vehicle. City engineering and sustainability staff will be on hand for questions. The City of Melbourne is staying ahead of the curve by installing the infrastructure to support and encourage the use of alternative fuel vehicles. This is the second charging station to be installed by the city. 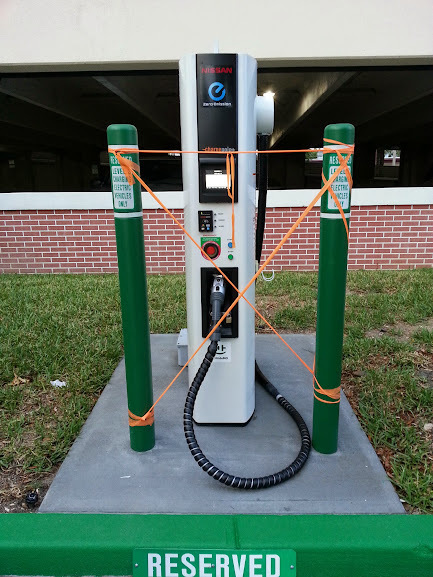 The first was installed in April 2013 in front of the Eau Gallie Library. Our goal is to add one station each year. The City will continue to seek funding from granting organizations and other sources. Future stations will also be located near activities of interest so that drivers using the stations will be able to enjoy city amenities while charging their vehicles. The new CHAdeMO charging station is still in testing mode. The CHAdeMO fast charger will be ready very soon. Don’t forget that we will be on site at the Brevard Zoo for their Party for the Planet today from 10-3 talking to local folks about the benefits of driving an electric vehicle. We know you have been waiting to see where our first community event would be so you can come check out Voltron the Red Chevy Volt! Our “no compromise electric vehicle.” We are happy to announce the wait is over! This Saturday April 12th 2014 we will be at the Brevard Zoo’s Party for the Planet from 10 AM to 3 PM. Look for our tent, banner, and the red Chevy Volt to be parked directly across from the entrance to the Zoo. We can not wait to see you there.